[User Guide] How to Transfer Music from Computer to Samsung S9? 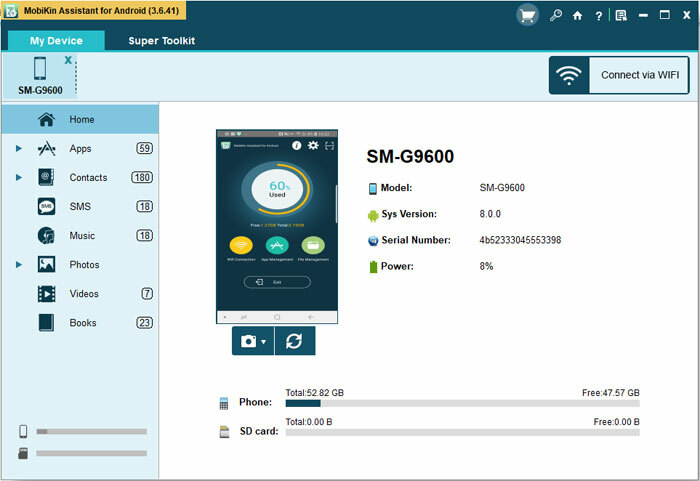 It must be an easy task for users to sync music from Samsung S9 to computer cause many people like to backup their phone data in case of data loss. But do you know how to transfer music from computer to Samsung S9 when you accidentally lose them and wish to get them back? If you don't know how, just read on to get the methods. And if you already know the trick to sync the songs, you can also read it to get more ways. Step 1. Use a USB cable to connect your Samsung S9 to computer. Step 2. Next, you can open the File Explorer or click the Browse Files and Folders on the Auto-Play menu. Step 3. Then you can navigate to This PC> Your Device Name> Phone Storage/ SD Card> Music. Step 4. After that, you need to open a new File Explorer window and locate the music you like. Step 5. Now you should Copy or Cut these songs. Step 6. Finally, you can go to the Music folder on your device. Then right click the mouse and click Paste to move the songs to your phone. Step 1. First of all, you need to go to Bluetooth on your computer and click on Android phone> devices & printers> add a device> select the device and then tap on next. Step 2. Then the computer will give you a code to assure that you are connecting to the desired device. And the same code will appear on the Android phone as well. Just verify it and two devices will be paired. Step 3. After the connection, you can start to transfer the audios from your computer to Samsung phone. When the transferring process ends, remember to disconnect your Samsung. Done! Your songs will be transferred to Samsung S9 now! But actually, many users do not like these two methods since they are time-consuming. Then how to transfer music from computer to Samsung S9 more quickly and safely? Just move to the next part to get the answer. - Backup your Android files to computer and restore them with one simple click. - Send group SMS and manage contacts on the program without any limitation. - Install Apps through computer and export them to Android phone. - Not only Samsung phones, it also supports many other Android devices, such as LG, HTC, Motorola, Huawei and so on. It equips so many powerful features which can help you to better manage your device. If you don't believe it, you can download the free trial of the software to make an attempt first. Step 1. Connect your Samsung phone to the computer with a USB cable and launch the software on PC. Here you need to enable USB debugging on your phone so that the program can detect your phone successfully. Step 2. Once the connected device is detected, the specific information about the phone will be listed on the interface. On the main interface, you can tap on the Music folder in the left panel. Step 3. Then on this page, you need to click on the New option at the top menu to bring out the file browsing dialog. Next, you can locate to the music files you want on the computer and hit Open to import them to your Samsung S9.